School is in recess this week 4/10. Enjoy your Spring Break! 1) Congratulations to RP Reading Contest Winners ! Congratulations to CP Speech Contest Winners ! Your achievement is inspirational to all fellow students. Hope you continue on the path of success ! 2) We are very pleased to see many students participated 2016 HOC Essay Contest. Many Thanks to the teachers who encouraged and guided your students in succeeding in this contest ! 3) Credit Program Placement test for current Hua Xia Students is scheduled on 4/24, at 12 noon - 1:15 pm, at I-101A . Students who are entering 7th grade at public school in year 2016-2017, and are new students to Credit Program, are highly recommended to take the test . Please plan ahead. Requirement for All testers, be sure to bring your parent's email address and parent phone number with you. For Current Hua Xia students, your Class ID and your Chinese teacher's name must be entered on the test paper. 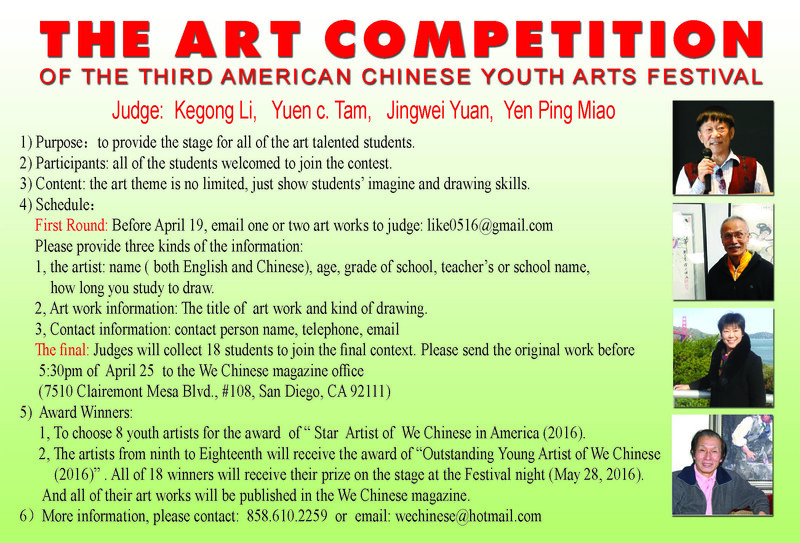 4) The 3rd American Chinese Youth Art Festival is calling on submissions for Art Contest (deadline 4/19). Students, your talent is precious, and there is no better way than present it in the spotlight! Please refer to the attached flyer for details. 5) Registration for year 2016-2017 will begin on 4/24. There will be some changes regarding payment method. Details will follow. Thank you, and I shall see you all next week April 17!